Hello again from Boomtown. It's not an Internet cafe so much as a gaming center, and so I've been set up on a rig using a browser called Opera. It works reasonably well, I suppose, but most of the usual Blogger controls are missing, which means that all y'all get a free pass today on running down links to Wikipedia. I even tried adding a few pics, but yer just gonna hafta wait. So yesterday featured a day trip to Roskilde. This is a beautiful city situated at the bottom of a long, narrow fjord. It was once the seat of Viking power and features an impressive cathedral in which kings like Harald Bluetooth are buried (he's actually interred vertically in a column). 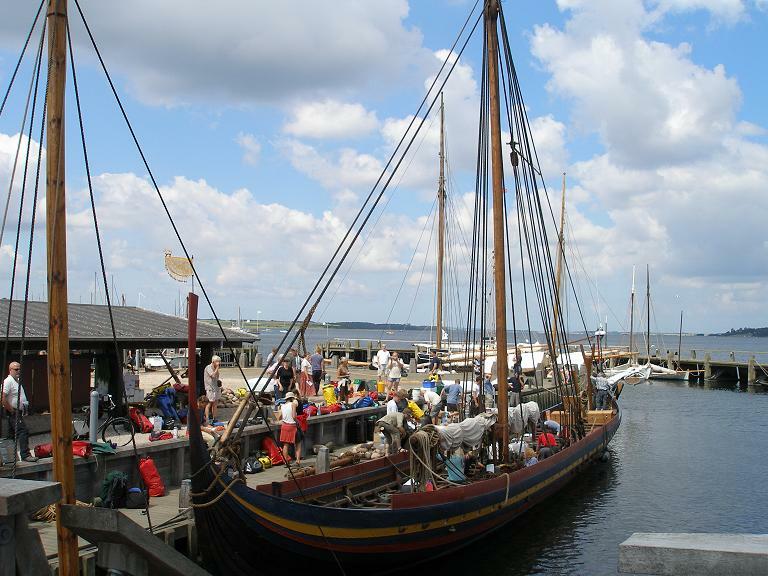 Jen and I visited Roskilde last time around, but we wanted to hit the Vikingeskibs Museet again, especially for the chance to sail a Viking Age boat. We were hoping not to run into a particular British family, since last time their gross incompetence at rowing definitely tempered our experience. We lucked out in that regard, but I suppose there's really no good way to train 16 people from different lands in the fine art of hand-eye coordination in a matter of minutes. 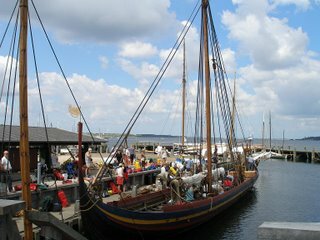 After putting the oars in the water, we pulled on the command of our captain (who spoke at least German in addition to English and Danish), and our tangle of oars somehow got our small trading vessel away from the dock. The square sail went up, the wind caught it, and we were cruising. Perfect. 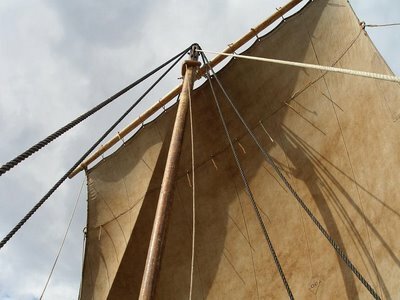 Once you work in these open craft, you see just how amazing it was that the Vikings were able to sail to lands as far away as Iceland, Greenland, and North America. The quarters are extremely tight -- there's no privacy, nowhere to go to get away from it all, and no protection from the elements. We got to watch a team of museum researchers prepare a warship for a month-long journey to Dublin (as part of a cultural exchange project). Each team member had been screened both physiologically and psychologically -- the North Sea is not a good place to have a breakdown, I suppose. Back in Copenhagen, the sounds of the jazz festival made their way to our fifth-floor room, and so we headed out to the quay. The sun was going down (pretty amazing here in the north), the wind was blowing, the ice cream was cold, and an amazing Faroese singer by the name of Eivør Pálsdóttir had the stage. Hmmm, sounds like an idea for a new reality show, "Oar to a Common Man" sort of a cross between "Hell's Kitchen" and "American Idol" with Ryan in the dual role of Chef Gordon Ramsey and Ryan Seacrest (does anyone else see the similarities between the two Ryan's other than me? It's eerie.) Anyway the object is to row like hell or get voted off the boat. You...didn't get voted off Ryan, did you? So Denmark's idea of international goodwill is sending a warship full of highly trained "personell" to Dublin? I'd hate to piss these people off. I rather think the adventure to Dublin with just one not-so-stable shipmate would make a fantastic study in the experiences that the Vikings may have .... experienced. (I hate talking to English majors.) So, very much like David mentioned- great fodder for a reality show, albeit perhaps one oriented for PBS. I also have visions of the crew attempting to hoist Ryan overboard, and he taking a rather swashbuckling stance against them, reaching for his sword... oh wait- you don't have one of those. Pity.